This My Time At Portia mod allows the player to level up infinitely. This My Time at Portia mod adds three levels to each of the resource delivery systems, with both increased maximum deliveries and new delivery items and bonuses. This My Time at Portia mod is intended to add hotkeys for different actions to simplify and speed up management process. 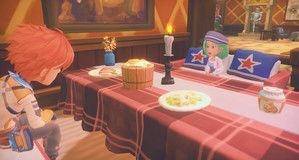 This My Time at Portia mod simplifies relationship management. This My Time at Portia mod makes the Flying Machine Pig much speedier and less of a stamina hog. This mod brings some immersive changes to My Time At Portia. This My Time at Portia mod prevents negative reactions and breakups with other NPC romances when you get married, as well as allows you to form new romantic relationships once married. This My Time at Portia mod allows you to accept as many commerce orders from the commerce board as you like, and change max number of orders on the board. This My Time at Portia mod removes the animations from both tree kicking and farm animal petting, making both actions instantaneous. You can toggle either behavior from the UMM settings menu. This My Time at Portia mod removes items stack limit.